The Institute for Social Internet Public Policy : What Do You Do When Someone On Your Mailing List Gets a New Email Address? 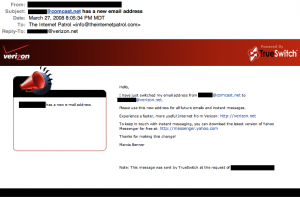 What Do You Do When Someone On Your Mailing List Gets a New Email Address? Often the way that you find out that a user’s email address is no longer valid is that you get a bounce back (“user not found”). And of course, you know to remove those email addresses from your mailing list immediately (you do do that, right?). 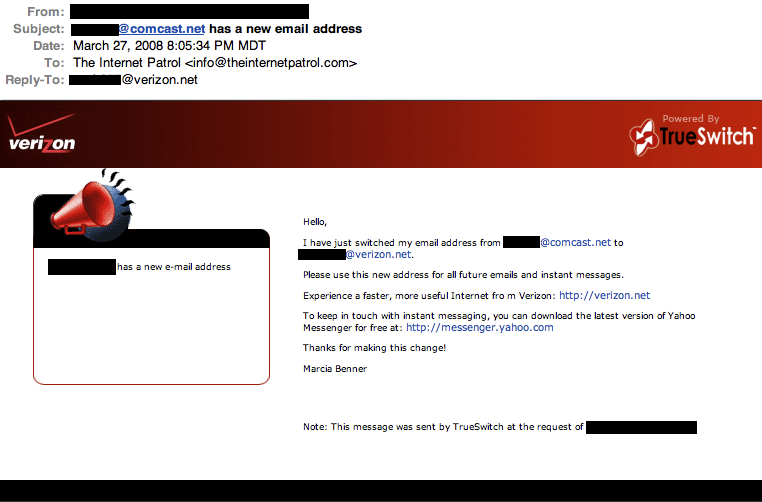 But sometimes a user will switch email addresses, and they will actually try to notify you. They may do this in a number of different ways, but most commonly it will be in the form of an email sent to the “from” address on your mailings (this is yet another reason that the email address from which you send mailings should really exist). ISPs which use TrueSwitch include Verizon, AOL, Earthlink, Yahoo, AT&T and Comcast. In fact, TrueSwitch is an interesting service – their primary business model is facilitating users switching from one ISP to another. As they explain it, “TrueSwitch makes changing your Internet Service Provider easy. We copy all your personal data to the new account, notify everyone with the new email address, forward emails sent to your old email address and help you cancel the old account.” The service is free to users if the ISP is one of their partners, or $19.95 if it isn’t. But back to what we were talking about: what do you do when you get a notice that one of your users has changed their email address? (Of course, not to belabour the point, but if you are sending from an email address that can’t actually receive these notices, that’s an issue all on its own. So fix that.) But assuming you are able to receive these notices, what do you do with them? Here’s what not to do with them: don’t ignore them! Because here’s what happens if you ignore them. First, the old email address starts bouncing. And that ticks off the ISPs. But even if you are quickly processing bounced email addresses (and you are, right? ), if you don’t take advantage of the fact that your users are telling you where to find them, you are losing users! So not only are you sending to email addresses which bounce (which decreases your deliverability), but you are not sending to users who may actually want your email (which decreases your ROI). So, be sure that you are monitoring your email, and watching for these change of address notices. And processing them! Because in this economy you can’t afford to ignore live users who actually want to hear from you, and are telling you where to find them.